Eagle Wire Display Shelving. Consists of shelf and pair of brackets. For use on all major shelving fixtures. Brackets are tier-notched to hold shelf in place. Shelves are zinc plated. Used primarily for gondolas in retail operations. Designed for use on all major shelving fixtures, such as Kent, Universal Nolin, Streater, Madix/Lozier, Royston, and PermaSteel. 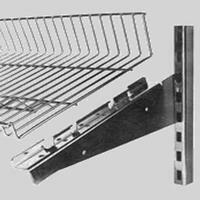 One-piece shelf bracket designed specifically for each major shelving manufacturer’s wall or gondola system. Each shelf bracket is tier notched to securely hold the display shelf in place. Brackets can be positioned horizontally or slanted. EAGLEbrite® zinc finish with MasterSeal® coating. Available in 36? and 48? lengths. Available in 10?, 12?, 14?, 16?, 18? and 20? depths.